Add your name and a bullet list with three of your favorite foods to the README.md document. Watch the Files tab as you switch back to the master branch. Where is the movies.md file? Observe the timestamped versions you commited as part of the version2 branch. Edit README.md in master by changing your name. Commit then Push. Edit README.md in version2 by changing the name to something different from the step above. Commit then Push. Fix Conflicts, then Save. ; Commit and Push. A full explanation of git revert and git reset will take considerably more time. If you find you do this a lot, investigate these commands fully. Navigate to the file you need. 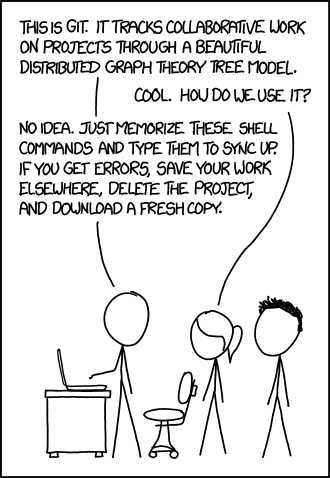 Copy the file. Back in your editor, paste over the source version. The above example is a trivial example of how to employ rolling back to a previous version. Rolling back is complicated. Depending on the complexity of your project, it may be more critical to leverage git commands during a roll-back. Software applications may be an example of this complexity. However, for simpler roll-backs, the simple explanations below may save you a lot of time for an operation which you would otherwise rarely perform. Sometimes the easiest thing to do is grab the file (or subtext from a file) in a previous commit that is already displayed on GitHub. To do so.